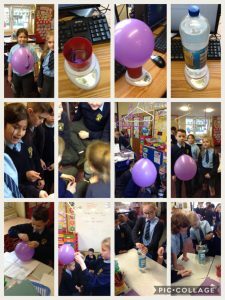 We have been investigating whether gases weigh anything. We did two experiments. We weighed a bottle of lemonade and we kept shaking it and releasing some carbon dioxide and then we weighed the bottle again and it weighed less than it did at the start. We also weighed a balloon and then we inflated another balloon and weighed that and it weighed slightly more. We have found out that gases do weigh something and we had a lot of fun finding that out. I found it very fun! I really want to do it again!